This is another great picture book biography by Jonah Winter. Wow, what an original idea for a children’s book. 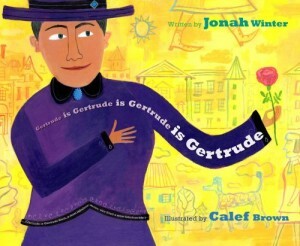 This is the story of Gertrude Stein, her life with Alice Toklas, and her life in general. But it’s just told in this lyrical, silly, charming way that emphasizes Alice’s importance without making a big deal about it. And it’s just wacky and delightful, with a repetitive style paying homage to Stein.